Determination of reservoir volume fluctuations is important for the operation of dam reservoir, design of hydraulic structures, the hydropower for the energy production, flood damage reduction, navigation in the dam reservoirs, water quality management in reservoir and the safety of dam. In this study, reservoir volume variations were estimated using average monthly precipitation, monthly total volume of evaporation, dam discharge volume, and released irrigation water amount. In the present paper, adaptive-neuro-fuzzy inference system (ANFIS) was applied to estimating of reservoir volume fluctuations. ANFIS results are compared with conventional multi-linear regression (MLR) model. The results show that reservoir volume was successfully estimated using fuzzy logic model with low mean square error and high correlation coefficients.
.	J.S.R. Jang, C.T. Sun, and E. Mizutani, Neurofuzzy and Soft Computing, A Computa-tional Approach to Learning and Machine Intelligence. Prentice-Hall, New Jersey, 1997.
.	E.H. Mamdani, and S. Assilian, “An experiment in linguistic synthesis with a fuzzy logic controller”, International Journal of Man Machine Studies, 7, 1–13, 1975.
.	T. Takagi, and M. Sugeno, “Fuzzy identification of systems and its application to modeling and control”, IEEE Transactions on System, Man and Cybernetics, 15, 116–132, 1985.
.	M.E. Keskin, O. Terzi, and D. Taylan, “Fuzzy logic model approaches to daily pan evaporation estimation in Western Turkey”, Hydrological Sciences Journal, 49, 1001–1010, 2004.
.	M.H. Kazeminezhad, A. Etemad-shahidi, and S.J. Mousavi, “Application of fuzzy inference system in the prediction of wave parameters”, Ocean Engineering, 32, 1709–1725, 2005.
.	O. Kisi, “Daily pan evaporation modeling using a neuro-fuzzy computing technique”, Journal of Hydrology , 329, 636–646, 2006.
.	O. Kisi, and O. Ozturk, “Adaptive neurofuzzy computing technique for evapo-transpiration estimation”, Journal of Irrigation and Drainage Engineering, 133, 368–379 , 2007.
.	M.. Demirci, and A. Baltacı, ”Prediction of suspended sediment in river using fuzzy logic and multilinear regression approaches”, Neural Computing and Applications, 23,145-151, 2013.
.	F. Üneş, “Dam reservoir level modelıng by neural network approach. A case study”, Neural Network World, 4, 461-474, 2010a.
.	F. Üneş, ”Prediction of density flow plunging depth in dam reservoir: An artificial neural network approach”, Clean - Soil, Air, Water, 38, 296 – 308, 2010b.
.	F. Üneş, M. Demirci, and Ö. Kişi, “Prediction of millers ferry dam reservoir level in usa using artificial neural network”, Periodica Polytechnica Civil Engineering, 59, 309–318,2015a,.
.	F. Üneş, and M. Demirci, “Generalized Regression Neural Networks For Reservoir Level Modeling”, International Journal of Advanced Computational Engineering and Networking , 3, 81-84, 2015b.
.	J. Shiri, and O. Kisi, “Comparison of genetic programming with neuro-fuzzy systems for predicting short-term water table depth fluctuations”, Computers & Geosciences, 37, 1692-1701, 2011. ISNAD UNES, Fatih . "Prediction of Dam Reservoir Volume Fluctuations Using Adaptive Neuro Fuzzy Approach". 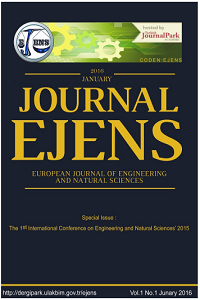 European Journal of Engineering and Natural Sciences 2 / 1 (February 2017): 144-148.